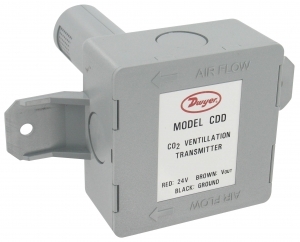 Dwyer Instruments Inc has released its Model CDD mount carbon dioxide transmitter. The Model CDD Duct Mount Carbon Dioxide Transmitter monitors the occupancy in a room by detecting the concentration of carbon dioxide in the return air duct. The non-dispersive infrared sensing technology automatically updates the calibration of the transmitter using a proprietary logic feature which limits the amount of error due to drift. The Model CDD can measure up to 2000 PPM in duct air flows less than 1500 FPM.